After almost 70 years of spaceflight, space debris has become a rather serious problem. This junk, which floats around in low Earth orbit (LEO), consists of the spent first rocket stages and non-functioning satellites and poses a major threat to long-term missions like the International Space Station and future space launches. And according to numbers released by the Space Debris Office at the European Space Operations Center (ESOC), the problem is only getting worse. "SSTL's expertise in designing and building low cost, small satellite missions has been fundamental to the success of RemoveDEBRIS, a landmark technology demonstrator for active debris removal missions that will begin a new era of space junk clearance in Earth's orbit." "The mission will comprise of a main satellite platform (~100kg) that once in orbit will deploy two CubeSats as artificial debris targets to demonstrate some of the technologies (net capture, harpoon capture, vision-based navigation, dragsail de-orbitation). 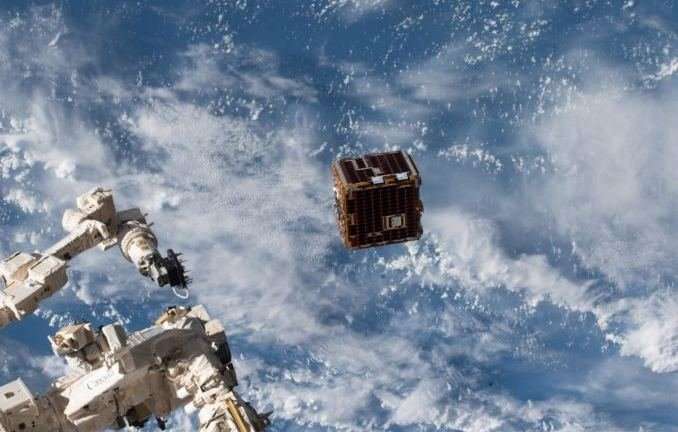 The project is co-funded by the European Commission and the project partners, and is led by the Surrey Space Centre (SSC), University of Surrey, UK." For the sake of the demonstration, the "mothership" will deploy two cubesates which will simulate two pieces of space junk. For the first experiment, one of the CubeSats – designated DebrisSat 1 – will inflate its onboard balloon in order to simulate a larger piece of junk. The RemoveDebris spacecraft will then deploy its net to capture it, then guide it into the Earth's atmosphere where the net will be released. The second CubeSat, named DebrisSat 2, will be used to test the mothership's tracking and ranging lasers, its algorithms, and its vision-based navigation technology. The third experiment, which will test the harpoon's ability to capture orbiting space debris, is set to take place next March. For legal reasons, the harpoon will not be tested on an actual satellite, and will instead consist of the mothership extending an arm with a target on the end. "The net, as a way to capture debris, is a very flexible option because even if the debris is spinning, or has got an irregular shape, to capture it with a net is relatively low-risk compared to … going with a robotic arm, because if the debris is spinning very fast, and you try to capture it with a robotic arm, then clearly there is a problem. In addition, if you are to capture the debris with a robotic arm or a gripper, you need somewhere you can grab hold of your piece of debris without breaking off just a chunk of it." The net experiment is currently scheduled for September of 2018 while the second experiment is scheduled for October. When these experiments are complete, the mothership will deploy its dragsail to act as a braking mechanism. This expandable sail will experience collisions with air molecules in the Earth's outer atmosphere, gradually reducing its orbit until it enters the denser layers of Earth's atmosphere and burns up. "It's wonderful to have helped facilitate this ground-breaking mission. RemoveDebris is demonstrating some extremely exciting active debris removal technologies that could have a major impact to how we manage space debris moving forward. This program is an excellent example of how small satellite capabilities have grown and how the space station can serve as a platform for missions of this scale. We're all excited to see the results of the experiments and impact this project may have in the coming years."